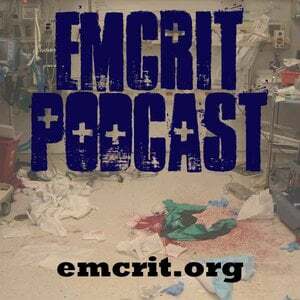 I am honored to be a regular contributor to Dr. Scott Weingart's EMCrit Podcast and Blog where I explore my interest in cognition, decision making, and technical skills performance under stress. EMCrit is dedicated to "bringing upstairs care downstairs" and improving the continuum of resuscitation. The blog recently joined forces with some other amazing authors: Dr. Josh Farkas, from the PulmCrit podcast, and Dr. Rory Spiegel from the EM Nerd blog. If you haven't checked it out, please take a look or subscribe on iTunes to the podcast.